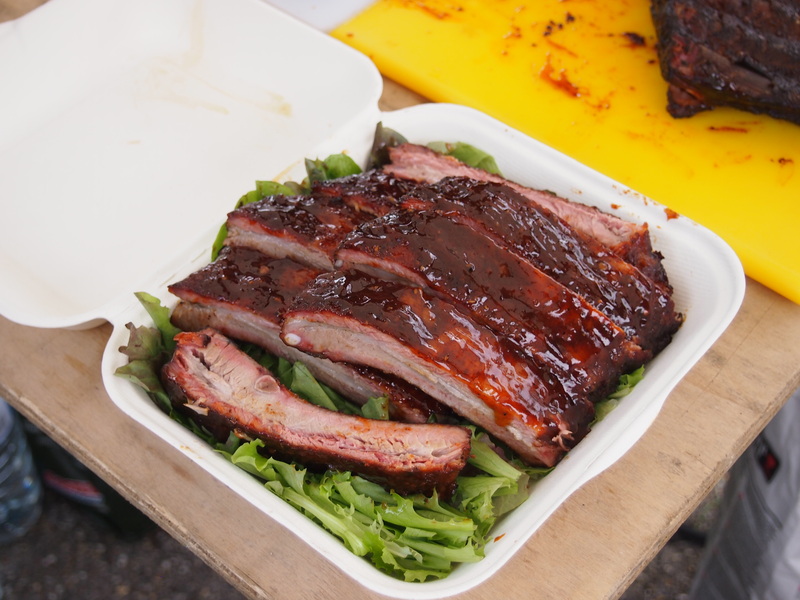 Backyard Brummies at Grillstock Bristol 2015 – KOTG Report and Rub Recipe | The Foodist. My buddy Nick “Professor Brisket” Loman and I started the Backyard Brummies 4 years ago in an unusual fit of bravado. It went something like “Let’s do a BBQ competition, I mean how hard is it to cook competition BBQ?” It turns out it’s pretty straightforward to do, all you have to do is turn up with the right equipment and drink lots of beer. But to do it well takes some luck, determination and a plan. The plan this year was to keep doing what we do with ribs and brisket and try not to mess up too bad on chicken and pulled pork. Here’s how the plan went down. Grillstock Bristol was set fair, the biggest festival to date. If you’ve never been then it’s not just about meat but also the music and mayhem (amen!). The King of the Grill area was foremost this year with punters streaming through the gates to be welcomed by the BBQ teams. The image of Priscilla Queen of the Firepit will be burned long into the memories of all who attended. Our pitch was behind the judging stage nestled beside three time reigning champs Bunch of Swines. We’re their unofficial lucky mascots having pitched next to them more times than not. I request every year to be next to them and every year some of that Swine magic rubs off on us. Plan going well so far. At the turn-in draw on Friday however we got number 22, which means out of the 22 teams we were to present our entries last on Saturday and first on Sunday. Not ideal and certainly not part of the plan. First up on Saturday is Chefs Choice, which we’ve always taken seriously. We love cooking, not just BBQ but everything. Traditionally it’s my round. The team let me have free rein this year so after vetoing eel for the past two years they finally gave in. I had in my mind that I’ll prepare a live eel on the day; fillet, skewer and grill it still wriggling. I’d even got an all clear from Grillstock Sarah, they’d have no problems with me doing that in front of the punters. It was a step too far, in the end I prepared a fillet at home and grilled it hot over coals on the day. Japanese style grilled eel is undoubtedly on of the best things you can put in your mouth. As this round was sponsored by Jack Daniels, we had to use JD or JD Honey in the dish. The eel was sprayed with JD Honey during the grilling and I whipped up a JD Honey teriyaki to glaze. Slabs of foie gras cooked on a skillet over coals, pickled cucumber, sushi rice and salmon roe made up the winning dish. 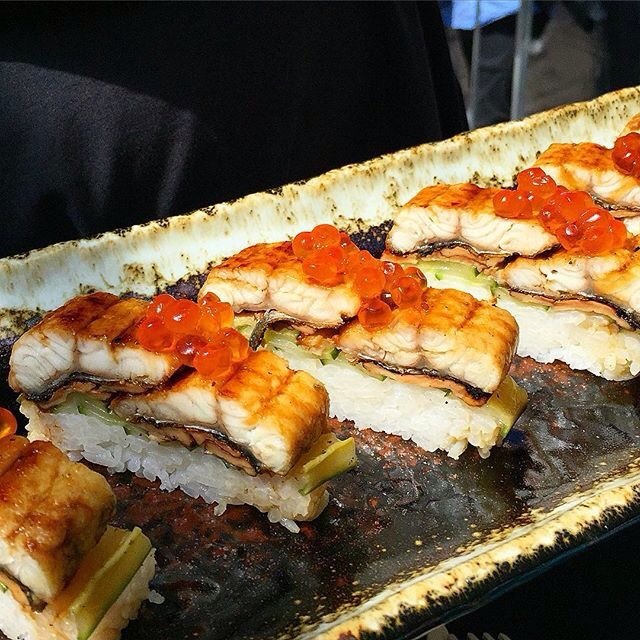 A pressed sushi of grilled eel and foie with JD Honey teriyaki. I think having the last turn-in on Saturday worked in our favour for this dish. The judges eyes lit up seeing this after the big meaty plates presented by the preceding teams. They liked it enough to make it the clear winner of this round. Second up is Ribs which has always been my sole responsibility. Probably because no one else wants to get up and get to the pitch first thing Saturday morning. But defending my title from last year I was eager and anxious in equal measure. After some initial equipment failure, I lost a massive chunk of time trying to fix my BBQ Guru, ribs were on track. I did what I always do to them then cooked them a little longer because if I learnt anything from last year people like them softer than I do! Turned out well in the end, ribs came in a respectable 2nd place after the Bunch of Swines. To complete my hat-trick on Saturday, the third dish up was Hot Wings. We dared to do Korean Fried Chicken wings last year and it came in 2nd place. I didn’t relish deep-frying on a BBQ again, not recommended at any time! Dom and I agreed to keep an Asian vibe so set about perfecting a boned out chicken wing stuffed with Thai sausage. They were smoked then skewered and grilled to render the skin a little crispy. A dousing of sweet chilli Srirachi sauce and served on a banana leaf. 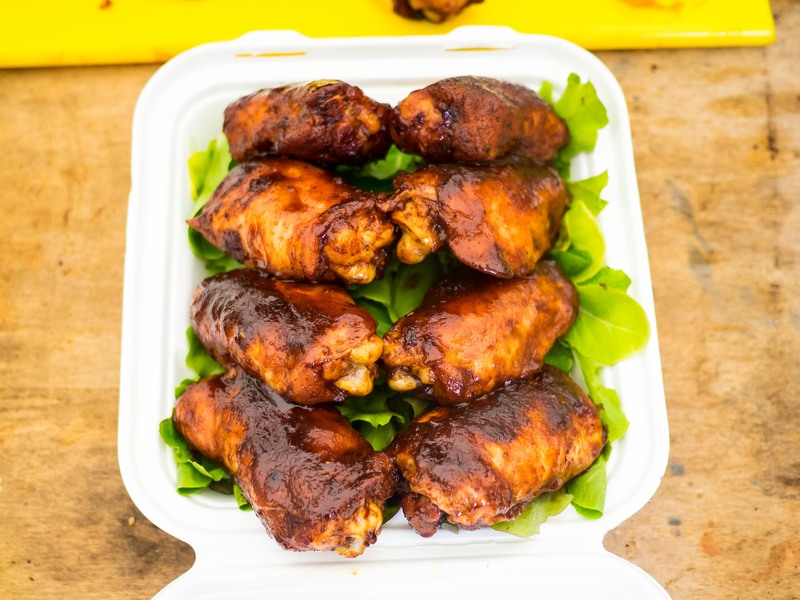 It’s some of the best cooking we did over the weekend but here our turn-in position worked against us as the other teams were looking to make the judges suffer by serving hot wings from hell. However, even with blistered lips the judges awarded enough points to give us 5th place. Really happy with that but more importantly a recipe and dish to keep for life. Day One finale is Brisket. The most iconic but most difficult BBQ meat to cook. I can hand on heart say that it’s almost impossible to buy this in the UK, you’ve got to know a great BBQer to eat good brisket because the commercial stuff just doesn’t cut the mustard. If there ever was an art to barbecue then knowing the feel and flex of those two brisket muscles, point and flat, as they cook and more importantly rest is just that. Nick is our artisan brisket whisperer. Having been wounded with a 7th place last year after coming 2nd and 1st in previous years, he was determined not to mess up. Nick and I agreed that a pared back rub, going more Texan would be better this year and trusted that our product was good enough. Thanks to Jeanette from our sponsor Alternative Meats for supplying the Welsh Wagyu again and at the 11th hour. We did your product justice and got 2nd place with it. Pride restored for Nick and for Bully! Best brisket in Brum for sure. After the brisket turn-in, we Jamaican jerked up all the chicken and ribs supplied by Grillstock and fed the hungry hoards and drank lots of beer in the perfect summer sunshine. De La Soul rocked the crowds on the main stage then the MeatRave DJs took over and rocked the after party. A more perfect Grillstock day I have never experienced. My turn for a lie-in whilst Nick and Dave worry about chicken which was first up and pork last, sandwiching Dom’s burger round. Chicken, remember the plan, don’t mess it up. We’re going for those competition thighs again. Uniform chicken pillows of semi-braised BBQ chicken. Dave and Nick detached the skins previous night, the fat scraped from them and wrapped around the thighs again before cooking. This helps with the all important bite-through that judges look out for. Seriously you don’t want to know how competition chicken thighs are made, put it this way no one ever cooks them at home for their own eating pleasure. It’s funny how out of all the main BBQ categories, it’s the one that bears the littlest resemblance to good BBQ in the real world. I think we did a good job, coming 10th but more importantly collecting some good points and staying in touch with the leaders. We came second in Burgers last year. Dom did kimchi and ogleshield sliders only to be beaten by The Beefy Boys. Well one of Beefy Boys was judging this year along with UK burger pioneers Yianni and Scott from Meatliquor. I don’t know if Dom was joking when he said he was going to make a trashy burger this year using Aldi buns but I convinced him (or made it clear my disgust at him) to make his own sesame coated buttery brioche beauties (he is a baker y’know). Aged chuck, secret sauces (ok mustard and mayo) and some expert cooking made these burgers the clear winner of this round. Just goes to show a great burger needs no messing around with. 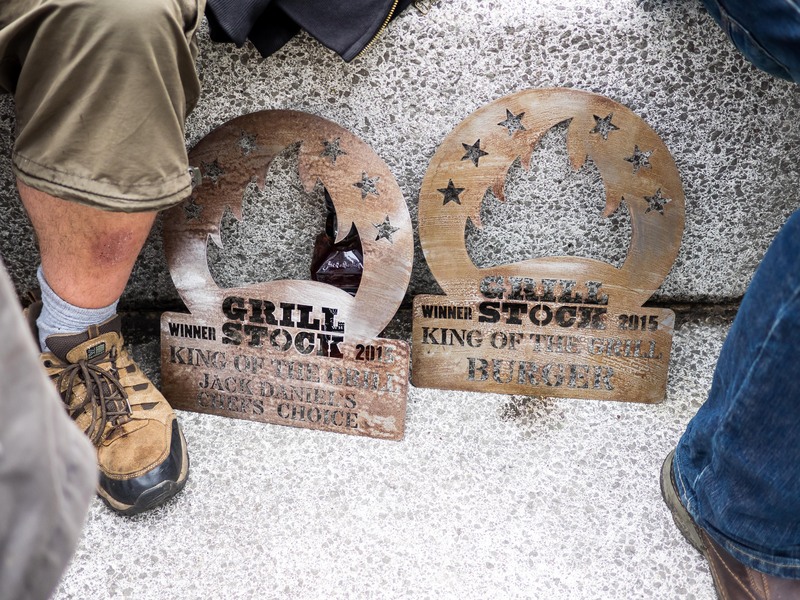 Backyard Brummies Win Best Burger at Grillstock 2015 from Homegrown Films. This is a behind-the-scenes look at the prize-winning burger created by Dom Clarke and the Backyard Brummies: chuck steak aged 8 weeks in seeded brioche buns (Jeffrey Hamelman recipe) with one or two embellishments. Pork, another of our nemesis. I’ve said it before and I’ll say it again the most boring BBQ, the category I’ve always avoided. Dave is our pork man, he loves the stuff. We smoked two butts this year, one provided by Grillstock and the other sourced from my favourite butchers Berkswell, a nice Duroc cross. Dave was as meticulous as ever with his processes and produced some nice juicy flavourful pulled pork. In the end we used the money muscle from the Duroc and pulled some moist bark and long strands from the Grillstock pork. Most importantly the plan worked, we mirrored the 10th place we got for chicken and scored valuable points. Actual BBQ pulled pork, not saucy shredded “streetfood” meat. Of course we didn’t know how any of the rounds placed until later on Sunday when the announcements were made on the main stage. As we were first to turn-in we had loads of time to grill up the extra pork supplied by Grillstock. We sliced and smothered it in our signature Hall Green Rub (recipe below), served it with Dom’s handmade kimchi to the delight of Sunday’s punters. We used every scrap of meat we were given and it made us happy to feed everyone who came by our pitch. When the awards were announced later, it took us a while to digest our two wins and what it meant to us. For winning the Chef’s Choice we get to travel to Nashville to attend the Jack Daniels Invitational BBQ event. For winning burger we can enter the World Food Championships in Florida and test our burger skills! Amazing prizes to look forward to. But best of all, we found out a couple of days later that due to a scoring error we actually placed overall Reserve Grand Champions!!! Second to now four times Grand Champs Bunch of Swines. Well done Ed and Emma. You are the best, we’re glad to have been your lucky mascots again. You want to know about BBQ’s, Grilling and Smoking? Look no further. Birmingham’s own Guru’s! Pingback: Central Texas BBQ – 36 hours in the smoke | The Foodist.